OK, I tried to write some meaningful posts this week, but my heart just wasn’t in it. I know you’ve heard this from me more than once before (especially over the last six months), but I just wasn’t able to focus this week. I couldn’t put together more than a few sentences on any topic, and that’s not a recipe for a good update. Sorry. I’m not in a very good place right now and this past week has been particularly difficult. I won’t go in to that now, but I’ll try to write more about it soon. On to the food! 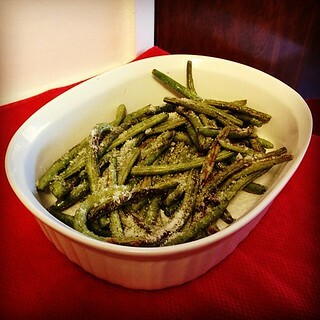 I made these delicious roasted Parmesan green beans to take to dinner at a friend’s house last month. She was making tacos and asked me to bring healthy side dishes. That required some thought. My first thought was rice, but I decided against adding extra carbs to the meal, and unfortunately I didn’t have enough time to make a batch of homemade salsa. So I rifled through my Pinterest boards and found this recipe that I pinned a long time ago and was dying to try. Dinner with friends was the perfect opportunity. Green beans aren’t the most obvious side dish for taco night, but they were ridiculously easy to make and really delicious. Roasting vegetables is definitely the way to go (for more evidence see my Parmesan-lemon roasted broccoli recipe). I’ll be making these again soon! Throw the green beans into a large bowl and drizzle with olive oil. Stir (I used my hands) until all of the beans are coated with oil. Season with garlic powder, salt, and pepper and stir to evenly coat. Lay the beans in a single layer on a cookie sheet lined with aluminum foil. Bake at 425 deg F for 10 minutes. Stir the beans to flip them over and then bake for another 3-5 minutes, depending on how done you want your beans. (The full 5 min was slightly too long for my batch. I would have liked my beans a bit crunchier.) Remove the pan from the oven and sprinkle with Parmesan cheese. Enjoy! Based on Skinny Taste’s Roasted Parmesan Green Beans.